How do you wish to supply drive to each wheel. The second consideration is that of speed. How fast do you want your rover to go. The more power/traction your Rover has, the slower it will travel. Do you want a hare or a tortoise? Drive the wheel via linkages. Creating a drive train from the motor to the wheel. Or drive the wheel directly. Mounting the motor as closely as possible to the wheel. Each of the above methods has its advantages and limitations. When driving the wheel via linkages, axle flex, and structure rigidity are important factors to take into account. The longer the drive train the more flex it will exhibit (making it weaker). The wheel assembly will need to be strengthened to take the increased load and stresses imposed upon it. 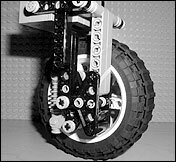 The drive train must also be flexible, allowing the wheel assembly to pivot when the Rover turns. 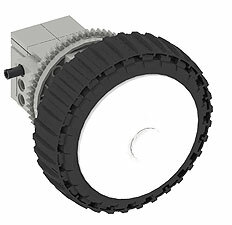 However implementing a drive train to supply drive enables you to mount motors away from the wheel, add gearing to suit specific requirements, and provide mechanically consistent drive to each wheel. 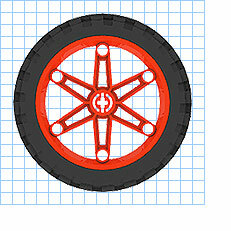 Directly Driven wheels have a motor mounted directly to the wheel (or hub). 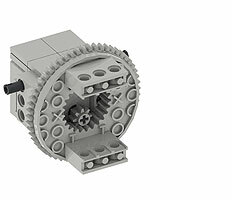 Drive is supplied either directly to the wheel, or through a very short and compact drive train (normally consisting of only one set of gears). When the wheel assembly pivots, the motor rides with the wheel. Such assemblies are simple, strong and efficient. Gearing is inevitably high, so your rover will have a good top speed. But, there are limitations. 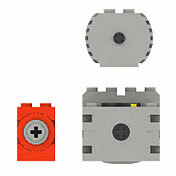 LEGO® 9V Geared motors are somewhat large and bulky. Micro motors are small but weaker. 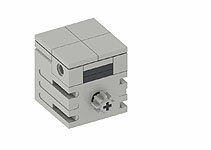 Both have to be connected to a power supply  That means cables which have to routed back to a power supply and the possibility of getting them tangled in the wheels. Speed is a measure of distance divided by time. How quickly your Rover can traverse a measured distance is a combination of the wheel size (Diameter) and the amount of gearing (gear ratio) you have applied to your motor. 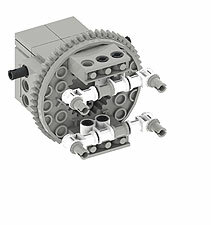 A typical LEGO® 9V Geared motor spins at approximately 220 revolutions a minute (RPM) under typical load (see sidebar). A drive train might reduce this by 24. The motor turns 24 times for every 1 revolution of the output axle. (This ratio is described as 24:1. 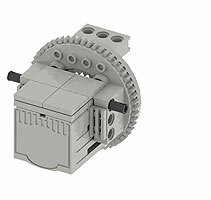 Incidentally this is a common gearing reduction available in LEGO® as it is the product of Worm gear driving a 24t gear). Applying this 24:1 gearing example to our Rover, its wheel will turn just over 9 revolutions (9.167) for every minute the motor is on. Assuming we have a Technic Motorcycle wheel attached (82mm diameter) this would result in a top speed of 2.361mpm (meters per minute). By changing the gearing reduction to 3:1 (8t gear to a 24t gear), our same wheel would turn at over 73 RPM (73.333) giving us a top speed of 18.89mpm (8 times faster). The wheels diameter acts as the final gearing of your drive train. Small wheels have a smaller circumference. They travel less distance per revolution, than larger wheels. 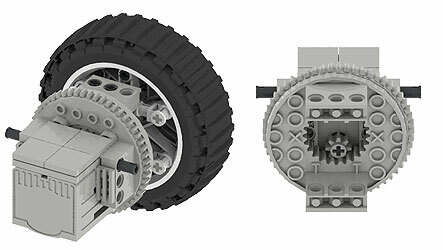 By changing to a smaller wheel in the above example, Say a small Technic balloon tyre (43mm diameter) our 24:1 gear train yields a top speed of 1.239mpm (about a 47% reduction) and our 3:1 gear train, a top speed of 9.908mpm. However the torque generated by both (the climbing power) has increased reciprocally by about 47%. However Increasing, or decreasing speed through gearing (in the drive train or by wheel diameter) comes at a cost. Increasing speed decreases torque, likewise a decrease in speed will bring about an increase in available torque. The bottom line is, the faster your rover, the less able it will be to overcome obstacles in its way. The slower it is, the more traction, or climbing power it has. To keep the wheel assembly small and compact. Keep the center of gravity low, helping the rover stay balanced over rough terrain. Due to the forces and stresses involved in driving the wheel I chose to mount the motor directly to the wheels hub. Rather than drive the wheel via an axle, I used a large Technic turntable. The wheel was connected to one side of the turntable, using 2 perpendicular axle joiners, and a motor to the other. The motor was fitted with an 8t gear and directly drove the inner 24t gear ring of the turntable. This achieved the goal of a 3:1 gear reduction from the motor to the wheel. Brian Sads powered turntable design was the starting point for the YogiCubs direct drive hubs. 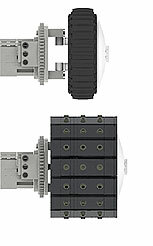 Direct drive proved to be more economical than the traditional method of supplying drive via an axle. It is mechanically strong used less parts, gears, linkages, axles etc..
Also the offset between motor and wheel caused by the turntable proved to be useful. 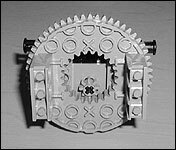 It allowed for a common wheel assembly to be used with Rovers that had different sized wheels (both in width and in diameter). 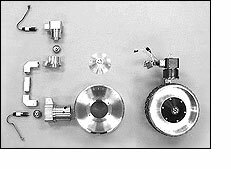 The design of the Drive Assembly is repeated for each wheel of YogiCub. One Design - Four wheels. Brian Sads Shrimp Rover has the drive motor mounted above the wheel. An axle from the motor drives a Worm gear which rotates a 24t gear at the wheels hub. Brian has used a lot of bracing to minimize flex and the use of a worm gear keeps the drive train tight and controllable. Rob Stehliks Fire fighting Robot has its motor mounted very close to the wheel. Rob says "the motor must ride on the wheel assembly so it moves with the wheel as it steers. advantages to this approach are that the wheel doesn't have any turn induced by the gearing when it is steered. It is also usually a simpler assembly. The disadvantages are that the motor must ride with the wheel, so the driven/steering wheel assembly is bulky and the wires get tangled." No two electric motors have the same efficiency. When comparing motor one will always spin a little faster, or slower than the other. In some motors this variation can differ up to 12%. Meaning one motor might turn at 200RMP, and the other at 224RMP. This might not seem a problem until you place each motor into a drive train to power your wheels. The result is each wheel will turn at a slightly different speed. Your Rover will ALWAYS veer off-course and never drive straight. Mario and Giulio Ferrari present a great description about nature of Torque in the book How to Build Robot with LEGO® Mindstorms. The following description is taken from page 20. Torque is the product of two components: force and distance. You can increase torque by either increasing the applied force, or increasing the distance from the center of rotation. The units of measurement for torque are thus a unit for the force, and a unit for the distance. If you have some familiarity with the properties of leavers, you will recognize the similarities. In a lever, the resulting force depends on the distance between the application point and the fulcrum: the longer the distance the higher the force. You can think of gears as leavers whose fulcrum is their axle and whose application points are their teeth. Thus applying the same force to a larger gear (that is to a longer leaver) results in an increase in torque. To calculate the top speed of a Rover whose's drive train consists of a Geared 9V Technic Motor directly driving (1:1) a Worm gear connected to a 24t gear. 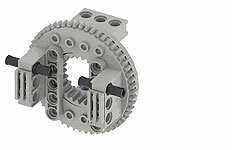 The output of the 24t gear is directly connected (1:1) to a Technic Motorcycle wheel and tyre combo. What would be the estimated top speed of this Rover? As above, except our Motor is driving an 8t gear instead of a Worm gear. Lets assume the wheel does not change.What would be the new estimated top speed?